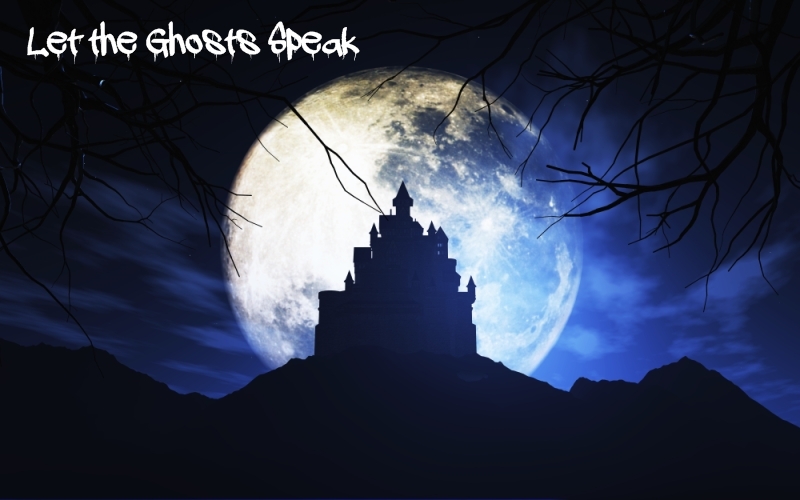 No one sent a piece to be critiqued, so I am posting an updated version of the beginning of my novel Let the Ghosts Speak. It includes the preface and the first chapter, which is a much longer excerpt than most that are posted here. This post will stay active indefinitely, so you can come back and add comments at any time. Discovered in a time capsule unearthed in Paris in 1962, this manuscript was part of a police-case dossier, filed and forgotten until a friend learned of my interest in nineteenth century jurisprudence and passed it along to me. The first portion, which is the lion’s share of the manuscript, was written by a hasty hand in English with an occasional French word or phrase. Because of its progressively unreadable script, I did more than simply copy it into a decipherable form. I translated it into something modern readers of English could understand while keeping the more easily recognizable French words he chose to employ. At all times, I was careful to be true to his style, his mindset, and his apparent madness. The second portion, a police officer’s addendum, was written entirely in French, and I employed the same method in translating that author’s words. Although I find the story contained herein to be doubtful at best, I respectfully submit it for public review, faithfully preserved and written in modern English with appropriate chapter divisions. It is daylight once again, and I am sane today. This time I am certain of it, though the hauntings of the night again tested my confidence. Therefore, while my mind is clear, I must take pen and ink, so kindly provided by my only friendly visitors, and begin this story. I cannot say how long this season of sanity will remain with me, so I will write quickly and continue during every day of clarity until I finish this account for the court. Although you might be dead by now, dear Mother, I am including an occasional personal side note to you, and I dedicate these recollections to your memory, for your lullabies echo from these bare walls. Perhaps you alone knew what love really is. The ghosts tell me that few remember. Alas. Forgive me. I am getting far ahead of myself. A sane man begins his tale at the beginning, so I shall relate where this story of heartbreak has its origins, in Paris where I, Justin Trotter, shared a one-room flat with Marc Noël. You would have approved, Mother. The room was austere and clean, only a bed and a desk for each of us, situated above a police commissary and within walking distance of the theatre and our university. Although Marc’s family could have afforded more opulent lodging, he chose a simple life, often to his mother’s vexation. As part-time students with thespian hearts, we spent our waking hours working for our employers, attending a class or two, studying, and rehearsing for our respective roles in whichever play the community theatre offered. Regarding employment, Marc conducted research for a law firm, while I translated manuscripts from English or Gaelic to French for a publisher in Paris. Our jobs were tedious, often mind-numbing, but they provided income that I sorely needed, especially because of my dear sister, Justice. On a fateful day in early November of 1860, Justice visited my flat, hoping to escape from her dismal fortunes, at least for a few hours. As always, we laughed together and wept together. The respite provided solace and hope for her and joy for me. Her smile brightened any room, and her eyes danced with delight, in spite of their blindness. Mother, I realize this is shocking news, but Justice went blind at the age of ten after a bout of smallpox, which almost took her life. If she had died, I would have been lost, alone. She always remained my best friend, my closest ally during our trials when we had to leave England. Even blind, she was the steady guide who kept me on the pathways of sanity. And I adored her. Late afternoon rain threatened as I helped Justice into the carriage that would transport her to Montreuil. Fortunately, it was covered, so she would stay dry during the journey. I tucked the skirt portion of her dress into the carriage to keep it from getting caught in the door. Loose threads dangled at the hem, and a gaping hole in her knitted shawl revealed a sleeve that had been mended with darker thread, obvious to anyone but a blind seamstress, though Madame Dupont probably knew and never said anything. How could I once again send Justice to that woman? She demanded complete obedience to her insufferable and constantly changing rules while steadily increasing the charge for Justice’s care. Still, I sent the money each month without fail, though it left me with barely enough to survive. When Justice’s carriage rolled down the street, the clouds gave way. Rain fell in blowing sheets. I hurried into our building and up the stairs to our flat. The room was empty. Marc had not yet returned from the legal office. Today, his absence was fortunate. For the past week he had been goading me into attending a party this very night, and during the morning he had chattered like a little boy, announcing that the masquerade ball in the old schoolhouse was upon us. I sat heavily in my chair, lifted the fountain pen donated by my publisher for translation work, and opened the book I had been working on. Considering the promise I had made to Justice, I couldn’t afford to halt my work. In fact, I had to work harder, faster, even on a holiday like today. Le Jour des Morts they call it, All Souls’ Day, a morbid holiday in my view. With the heavy rain giving us an encore from yesterday’s performance, the street was again turning to mud, the slimy sort that brings horses to an untimely end. If it continued, flooding was sure to follow. I stared out our window at a two-horse fiacre splashing through turbid water and imagined my own tumble in the mire and a painful journey to the physician, something I could ill afford, especially now. Yet, even that would be tolerable compared to dressing up in whatever ghastly costume Marc had in mind for me. With his imagination, I doubted that I would survive the shame. A foot sleeper was more like it, but I held my tongue. I wrote something unimportant about the Renaissance era translated from the tedious history book. I needed to appear busy—disconnected from Marc’s make-believe world of romance, a world in which people lived happily ever after. I knew better. “Give me a moment to think.” I set the pen down and closed my eyes. Maybe Marc’s offer was my opportunity to get a place for Justice and me. With that much money, I could rent a decent flat for at least three months. Of course, I would have no income until I finished the book, but if her confidence in her weaving abilities was justified, we might be able to eke out a living. Besides that, the frequent rain had kept Mark and me inside for too many hours and sometimes at each other’s throats. The morning’s rehearsal had been canceled due to our director’s sudden illness, the wretched fever that had stricken so many who had reached her advanced age. At least this malady wasn’t as deadly as the cholera that broke out soon after Justice and I arrived in France at the age of seven. When the disease struck our adoptive parents, we had to lean on each other to survive, thereby sealing our unbreakable bond. The combination of my passion to help Justice and my need to break away from this tedious text overwhelmed my distaste for social gatherings. Yet, before I agreed to go, I could use my pretended hesitance as leverage to gain more information. “All too well.” I let my gaze drift back to the window, though a curtain of darkness had fallen. Marc knew of a past spat between Francine and me, a minor dispute about politics that ended in laughter. He seemed not to know, however, about a more recent, harsher skirmish that left me fearful of reentering her presence. That topic, dear Mother, I will address at the proper time when I hope to dispel any thought that Francine is a hot-headed shrew. It was my own foolish tongue that invited the lashing I received. The getting dressed part proved to be easy. The coat and breeches fit perfectly. In fact, if our mirror reflected truth, I looked rather dashing … relatively speaking, of course. I knew better than to swallow the forbidden fruit of self-admiration. After donning our boots and hooded cloaks, we sloshed through rainwater trenches and muddy streets while infrequent gas lamps illuminated a meandering path that led us past squalid habitations. The rain kept the prostitutes inside, and the street children had run for cover, allowing for unaccosted travel, though the usual stench worsened. Urine, feces, and an occasional rat carcass saw to that. Perhaps someday Monsieur Haussmann’s renovations would reach our section of the arrondissement, but until then, we had to endure the sad estate of crippling poverty as well as winding narrow roads, missing cobblestones, and dilapidated buildings. We arrived at the carriage house and caught a covered fiacre that took us to the outskirts of the city. Along the way Marc chattered about his mother’s obsession with his decision to live in humble circumstances and pursue acting instead of banking. Her latest diatribe included a threat to remove him from her will, but he brushed it off with a laugh. She had many years left to live, plenty of time to prove to her that he had made the right decision. A rattle interrupted Marc’s monologue. Horse hooves and carriage wheels clattered across a wooden bridge that spanned a brook, now swollen by the frequent rains. If the current storm failed to break soon, the brook might transform into a raging river. As the fiacre drew within a stone’s throw of the Seine, the schoolhouse came into view. Long abandoned, the school could easily pass for a museum—stone construction without; arched entries leading to a covered breezeway on the ground floor; tall windows lining the walls on the second; and tiny peek-through windows on the third. Candlelight shone through one of the first-floor windows, providing a view of minglers inside who were about the business of evaluating each other’s upper-crust costumes while sipping blood-red wine from Bordeaux glasses. I had pretended to be rich in a recent theater production, so being in costume felt natural. I could play this role. After deboarding, we entered the main door, strolled into a parlor-like anteroom, and took off our wet raingear. Potted chrysanthemums of yellow, white, and purple lined the floor along a path toward an assembly room to the right, a friendly gesture to most people, though to me it felt like the path of a death march. My social ineptitude saw to that. The moment we entered the assembly room, dozens of eyes turned toward us. The array of costumes was dizzying—kings and queens, knights, clowns, animals, and even a wrapped gift box. Yet, one girl, perhaps seven or eight years old, wore only a simple white dress with a black sash tied in a bow at the back. Her dark curls and piercing eyes made her look like my sister when she was that age. The resemblance was striking. Francine broke away from a clutch of ladies and approached in full Joan-of-Arc array—boot-leather trousers and an armor-plated vest. A thin mask surrounded her eyes, and makeup hid her telltale freckles, a shade that made her look sun baked, a natural tone for a hard-working peasant girl who had transitioned to a soldier. The makeup also covered a distinctive birthmark on her neck, an oval spot that she usually didn’t mind showing. She also wore a dark, pageboy-style wig that concealed her long ginger hair. Yet, no one could mistake her for anyone but Francine Noël. “Come along, then.” She curled her arm around mine and led me deeper into the room. Her touch sent tingles up my arm, but I stayed calm. She seemed to be at ease with me. I needed to be the same. Maybe she and I could be a couple after all, at least for the evening. Although the violin continued playing, no one danced. Perhaps they would change their minds later when the wine had taken effect and numbed the participants into thinking dancing was actually fun. “I see.” She cast a glance Marc’s way. He was chatting with two young ladies dressed as cats, apparently twin sisters vying for his attention. With one hand on the stairway’s central pole and the other clutching the candelabrum, I climbed the stone steps. As I ascended into darkness, the flickering flames created an undulating aura around me that prompted a dark memory. Mother, I refer to our last hour together, the fateful night we walked single file up our own spiral staircase, the night we heard the crash and Father’s shout. You limped, as usual, careful to avoid pain in your malformed foot, and I slowed my pace so you could keep up, though I wanted to rush ahead and learn the reason for the noise. My sense of dread then was the same as I felt now, though not because of the darkness above but because of the darkness below. I had once again disappointed Francine. This exerpt captured me immediaely. I can’t wait until it is picked up by a publisher and I can buy my own copy. I like the addition of Justice. 🙂 It makes Justin seem more relatable, in my opinion. Very engaging. I was drawn into Justin’s situation – especially with Justice added – and am keen to find out how the story continues. A ‘question’ has definitely been posed. I might say, though, that “No worries.” – said by Marc, I think, is a very modern phrase that seems out of place with the rest of the antiquated speech. You might need to change it for something else. Good point about “no worries.” I will change it. Thank you. I am not a published author yet, but I would like to share my thoughts with you. Your writing, once again, shows great thought and depth, especially where the characters are concerned. One of my favorite parts of this excerpt is the affection that Justin and his sister hold for each other. As an historical fiction fanatic, I find the dingy French setting most interesting; it’s reminiscent of Dumas flavored with a Dickens flare. Your prose is beautiful and poignant and the mystery surrounding Justin would keep me reading as would just wanting to know more about this moral, upright young man who is destined for what seems to be a sad fate. It is a captivating piece. With your work being so clean and polished as it is, I have only a couple comments which, against the whole, are just small suggestions. In the second paragraph of the preface, which is in the first person POV of a translator, the use of “unreadable” seems to be slightly out of character voice. A man of education may be more likely to use “illegible” instead. The tenth paragraph of chapter one mentions the “pathways of sanity.” I myself would use pathway in the singular because sanity is one, whole, complete thing whereas there are many different ways of being insane, rendering “pathways” more applicable to insanity. The thirty-sixth paragraph has Marc describing the ball. He says it’s sure to be a foot tapper and this seems out of the vernacular of the time, but seeing as I do not know the term’s origin, I could be wrong. During the conversation that Marc and Justin hold in their flat between paragraphs forty-seven and fifty-six, I would like to see what Marc is doing as Justin is sitting at the table. The readers know that Justin was writing, but is Marc taking off his wet cloak? Perhaps he is loosening his collar or taking a seat at the table as well. I would also have liked to know more of what the assembly room of the masquerade looked like. The setting was vague especially since, just before then, you described the sordid streets of Paris so well. My favorite part of reading is simply imbibing the beauty of words. Prose is just as lovely as poetry—even more so at times in my estimation—and the beginning of you story moved me as good words do. Thank you, once again, for letting us have this sneak peek. It’s almost like a movie teaser! In Christ’s peace and with respectful regards! Thank you, Haley. These are great ideas. I will see what I can do to implement them. I’m up to chapter four now. Thanks for the full copy. The only thing that bothered me so far is how the story is framed as a letter to his mother, but in the first chapter he felt the need to tell his reader that Justice is his sister. I thought his mother would know this. I know some allowances have to be made for the fact that the actual reader doesn’t know this, but perhaps Marc could be used as a vehicle to establish that Justin and Justice are siblings. I found the first chapter just a little bit slow, but by half way through two I was hooked. You will learn by the end of the story that this is not a letter to his mother but an account to be given to a judge. He addresses his mother as an aside as he plans to give a copy to her if she is ever found. I am glad you’re enjoying it. I will write quickly and continue during every day of clarity until I finish this account for the court.